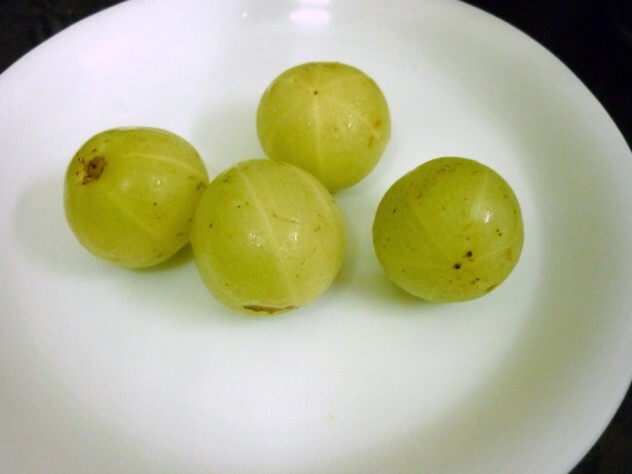 Amla or the Indian Gooseberry has rich source of Vitamin C. It has various health benefits and when consumed on regular basis, aids for a healthy life. When in season Amlas are consumed in various forms. 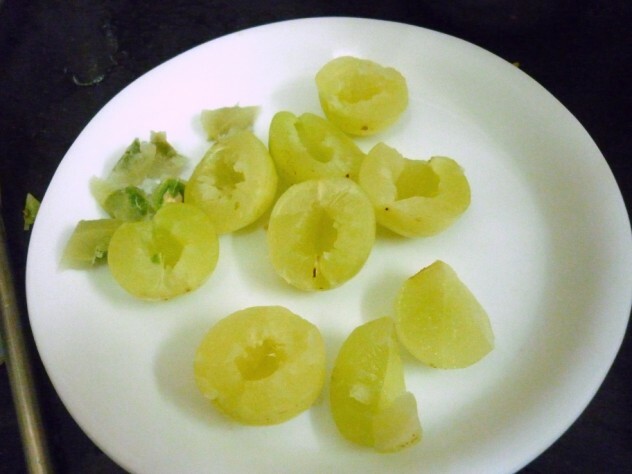 Most common way is to pickle the amla and consume through the year. 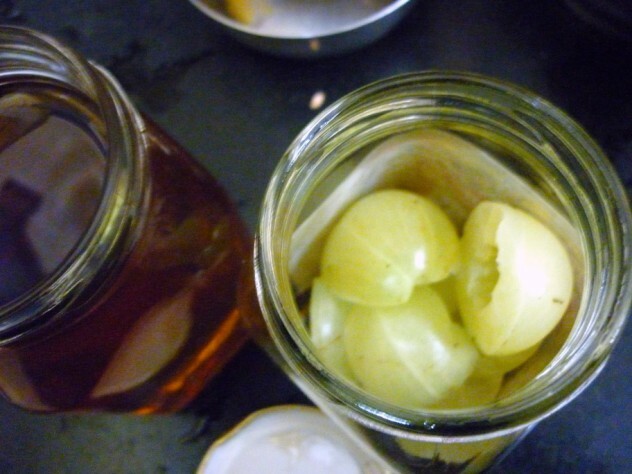 Two other methods are to make the Amla into murabba or preserve in honey. 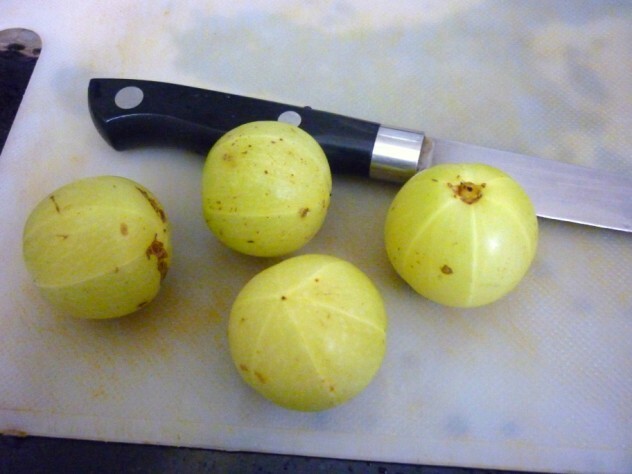 We get two varieties of Amlas, the one very big and the other smaller variety which is called Ara Nellikai in Tamil. The smaller ones are not that sour to eat and can be eaten as a snack. While the bigger ones are really sour, though after eating it, you will have a sweet after taste. 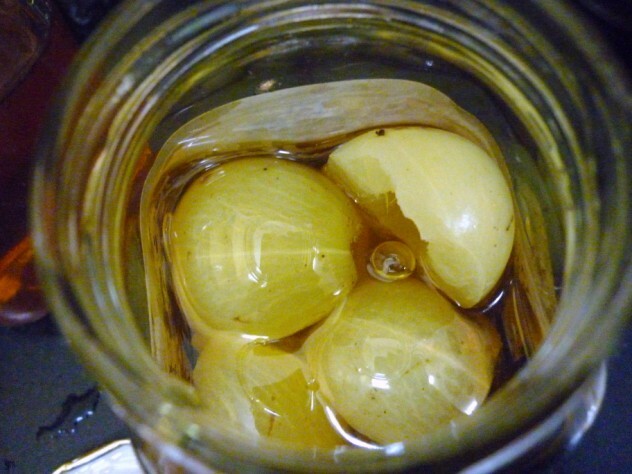 So preserving these bigger ones in honey was the simplest way to eat them without much difficulty. 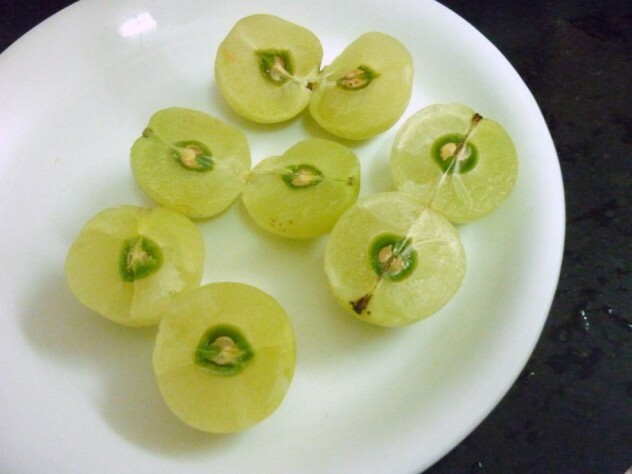 We do get those sweeten amla in stores, which obviously have high sugar content in them. 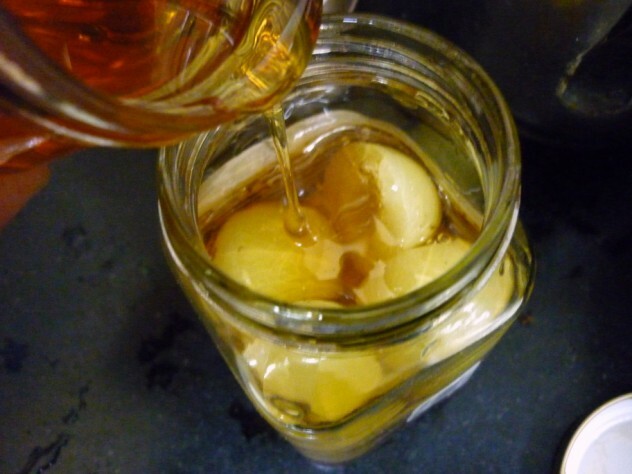 Preserving in honey doesn’t make it sugary though the sourness gets reduced. Lets see how we can preserve the amlas in Honey. Wash and pat dry the Amlas. Using a sharp knife, slice the amlas. As the seed inside will be very hard, you can place the knife and using a hard object gently pat on the top. This way you can easily slit open the fruit. See how pretty the fruit looks! Using the sharp tip of the knife, insert the knife and scoop out the seed in the middle. Have the honey bottle ready. I used another honey bottle, so I didn’t have to bother about cleaning, drying the bottle to be stored. Make sure the bottle you are going to use is clean and dry. 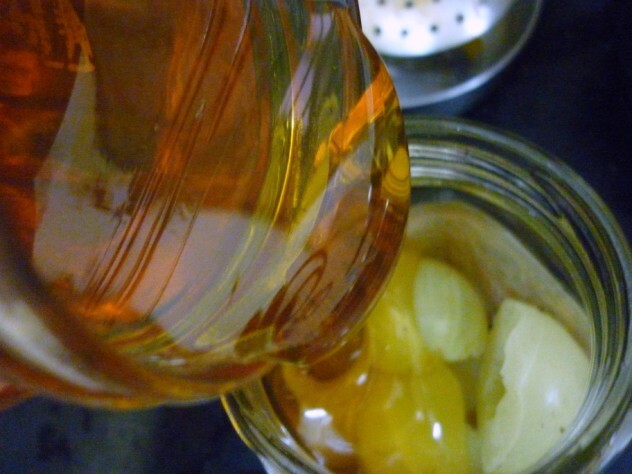 Slowly pour the honey into the bottle until you cover the entire amlas used. Shake gently and cover the mouth with a muslin cloth. This site advises you to keep the bottle in sunlight for an hour, while I didn’t do it. Still my Amlas are good to eat. Though I would say you should use your judgment based on how your Amlas appear after preserving in the honey. The Amlas are ready to eat after 15 days of storing in honey. If you are going to store in sunlight, keep it for 15 days for an hour, then the amlas are ready to be consumed. Hey that is very interesting..I have never heard of this before! 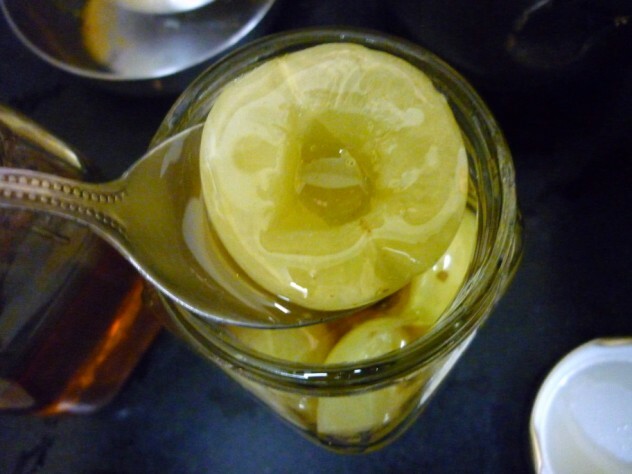 Love these honey dipped amlas…Heathy and delicious…. wow…i should make this for my amma…doctor had suggested her to have this for her health..Thank you so much valli..
Omg, wat a healthy preserve, but unfortunately amlas are super expensive here to make preserves like this:(..
That looks so delicious…It is one of my favorites..my mom always keeps stock of these and this is the only way I eat amla. thanks. will do this pronto. Interesting. I loved to snack on the little berries but never developed a liking to the big sized ones. 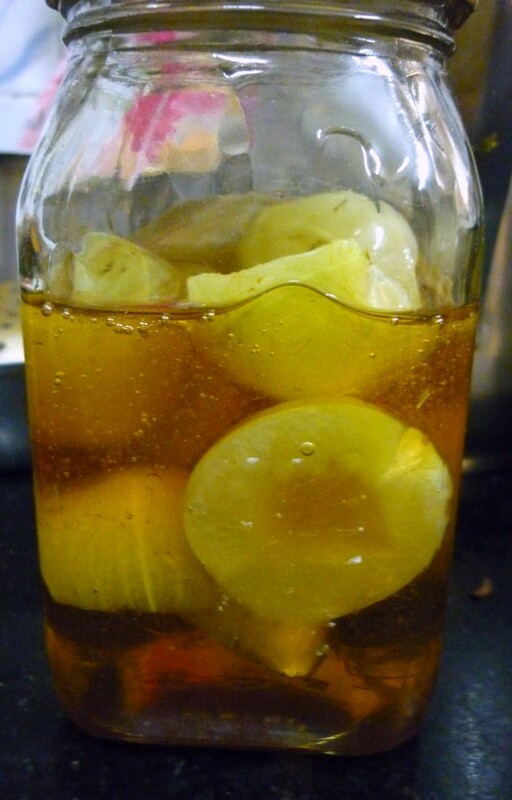 The ones we get here are frozen variety and I end up making a short life pickle. I dont know if i missed it in your recipe but how long should be store this before use? Andy Looks like I wasn't clear myself, have updated the post..thanks for asking. WE are about to put pitted amlas in honey like you did and not putting under the sun. Can you tell me what is the maximum time that you have preserved this way. Because my mom's friend told here that, they did the same and with in week they can see the fungus allover and it smelled horrible, so they threw it away. Thanks! Vinaka I did about for somewhere around 15 days or so, moreover since we made a point to eat them on daily basis, we sort of finished it quickly. But storing it in sun for an hour with muslin cloth and stirring it frequently ensured it was good. I am sorry I haven't tested beyond this time..do try and let me know how it turns out. 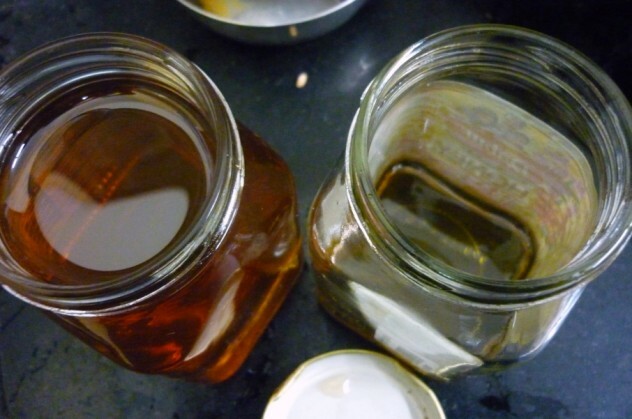 My only concern putting under the sun is for an hour for 15 days is heating honey kills all the nutritional values of Honey and what's left is a mery honey sugar solution. What we did is bought huge quantity of amlas for whole year, because they only available now. Please find out if you can from your friends or grand parents. In the mean time we are only testing half a kilo to see for a week and if everything is ok then taking risk of complete quantity. But I am guessing since you tried for 15 days, we won't find anything with in a week. In your case I thought you did not put it under the sun from your comments in the article, but you did put it under the sun, made it tricky for me. Any way I will let you know how we go. Thanks! vinaka Wow that's quite an amount you got. I really will not want you to experiment like that if you are not sure. Like I said I wanted preserve and eat. And we finished it off within days of storing it. Unfortunately I didn't store it for a longer time to confirm the exact shelf life. 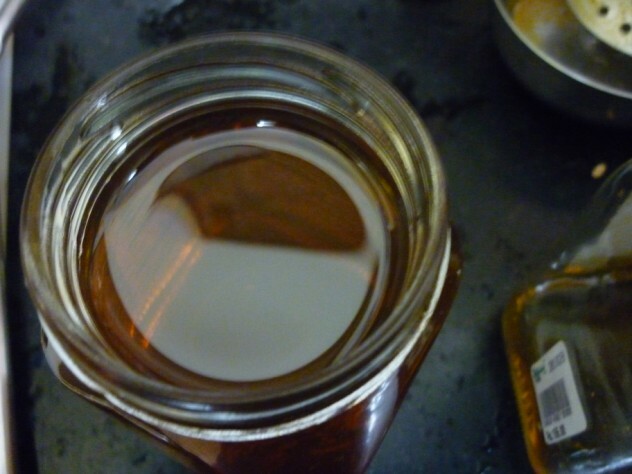 However as you said putting it under Sun may make it just a sugar water, unfortunately we may loose some nutrients from honey, I am hoping that would have been absorbed by the amlas…all the best, I hope they stay really good. frends I am gonna try this out …. can anyone share ur experience on this ……. Raju As I have said in my previous comment, I was not able to save it up for the entire duration. Will surely try this soon with the next batch. At the end of 15 days, are the amlas dry or still liquidy….wat do u do to dry them? Anon The amlas were still soaked in the honey, it became soft. I haven't tried drying these though. You could dry some and check it out. Can we cook the amlas before adding honey to them?? I have not tried cooking the amla before adding. However, going by the cooking process, I think the amlas will turn very soft if you cook and add. After one one month soaked with honey ,it occurs bubbles on top of the bottle with liquid ,is it ok or any other suggestions? 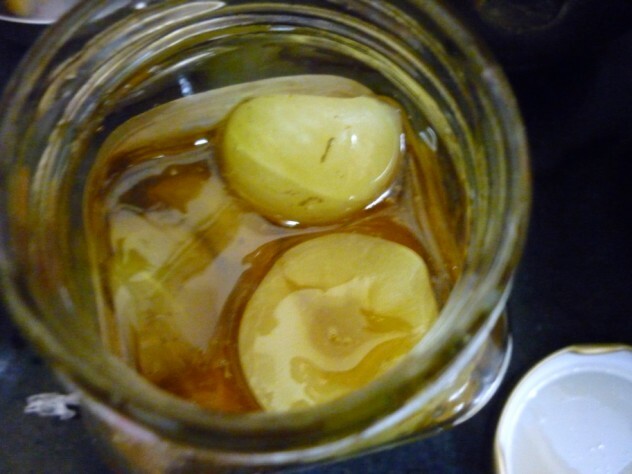 Bharani, did you put the soaked amla with honey in Sun?..If it was sun dried, the liquid and amla will be good. However, as said you have bubbles, it could mean it has gone bad. Ideally this is something you will be doing during summer and not during this time.